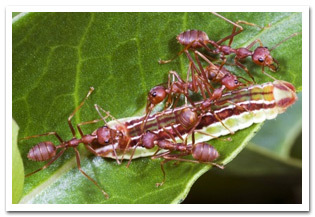 Adams Exterminators is now offering an annual fire ant control program. By the end of your one-year program you should see a dramatic reduction of up to 90% of fire ant mounds. This year, with adequate moisture, and moderate climate, fire ants will flourish. For this reason, Adams Exterminators, in cooperation with our suppliers, has developed a unique “Fire Ant Control Program”. With this new program, you will receive four applications during the year (one every three months). Using our unique blend of fire ant control products, each application is strategically timed to maximize the effectiveness of these products, thereby reducing the number of fire ant mounds on your property. Let Adams Exterminators provide a safer, better environment for you and your family. We want you to completely enjoy your time outside without the worry of fire ant stings and ugly fire ant beds. Please ask your pest control technician or call our office and let a member of our staff discuss the significant benefits of the Adams Exterminators “Fire Ant Control Program” with you.